Let's all take a moment to reflect on how AWESOME these earrings are! At our show last weekend, along comes the lovely Julie who wanted an earring that will go with absolutely everything. After much thought, she designed these completely unique, totally fabulous earrings! The back piece is an antique gold disc, about 1" in diameter; it's topped with an elongated antique copper diamond, and a sparkly matte silver upside down triangle and finally an antique silver leaf! All the pieces hang on a ring from a surgical steel earwire. 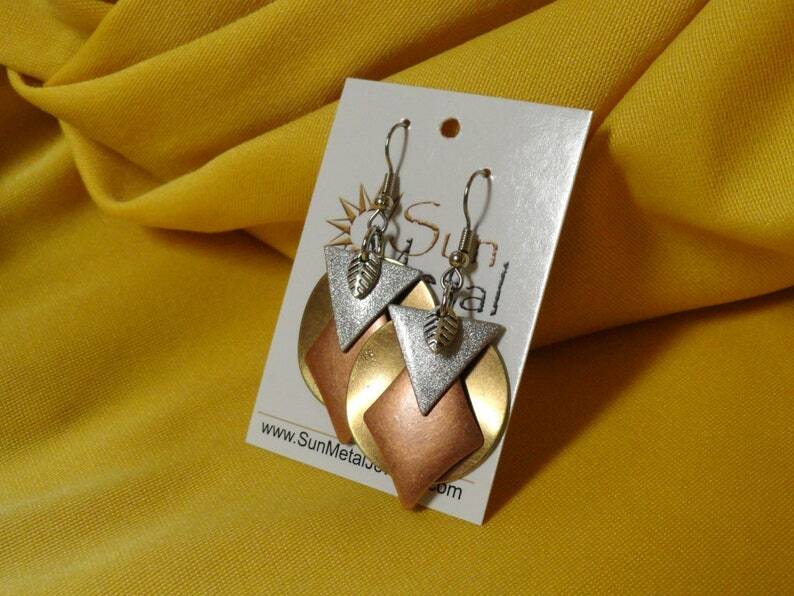 Although there are a lot of pieces, the earrings are incredibly lightweight. They are a wonderful mix of different colors, shapes, sizes and textures and are flattering no matter what you're wearing! Julie, you are a rock star!